It is of course preferable to win roulette in the comfort of home. That’s why most systems to play roulette are designed with roulette software provided by online casinos. In my many years of experience, I’ve come across many methods and secrets to play. But I have never seen any roulette strategy that can genuinely beat software roulette, otherwise known as Random Number Generators (RNG). I’ve seen some very good systems that do well in the short term at online roulette, but they all eventually fail. The only wheels that can be beaten are casino roulette wheels where everything is real, and exists physically. It is no coincidence that every system that claims their system beats online roulette software has received a fraudulent review. I have had my fair share of working with RNG software and the only way it can be beaten is if there is some kind of flaw in the software. And I assure you such flaws do not exist in modern RNGs and even if there were, the casino would quickly know about it and take corrective measures. The only true method of beating roulette consists of utilizing physics to predict where the ball will land. This can only be done on real casino roulette wheels, not in the virtual environment of roulette software games. An in fact there are many ways of achieving this. This is not to say you cannot play online and win, because indeed there are numerous casinos online that provide play on real physical wheels that are viewed by webcam. 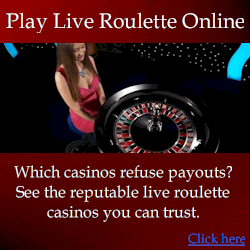 Such online webcam gambling where real wheels are used is not a guarantee that a casino can be beaten though. Indeed some casinos are blatantly dishonest, and will refuse payouts. 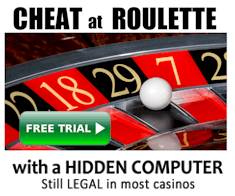 Many online casinos operate in jurisdictions where laws are very liberal, or where gaming is an unregulated industry. In such situations, play may be subject to very unreasonable terms which guarantee players lose. Certainly thoroughly read the terms of service before depositing money and commencing play. One example from casino I wont name is they clearly state they reserve the right to ban a player if they “suspect” a player of using professional techniques. This same casino forbids uses of any form of “system”, including but not limited to progression bets. With such terms, unless you randomly place bets of the same size, you are in breach of the agreement, and stand to lose your deposit and winnings. Even if you won in a way that the terms of service permitted, the casino need only “suspect” you of professional play, and you lose your entire bankroll. Generally real casinos don’t have such unreasonable terms, and if they refuse a payout, they need a very good reason to do so. There are still some jurisdictions with real casinos that are as dishonest as some online casinos, but they are rare and typically only in third world countries where the authorities have more to worry about than the standards of gaming practices.